Dr. Ananya Mandal is a medical doctor, having achieved her MBBS degree in 2002 from Calcutta National Medical College & Hospital, followed by an MD in Clinical Pharmacology and Therapeutics from The Institute of Post graduate Medical Education and Research, West Bengal. 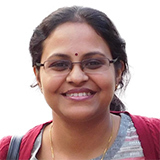 At present she works as an Associate Professor at a Government Medical College in West Bengal, teaching Pharmacology to second year MBBS students and also post-graduate students pursuing an MD. Dr. Mandal has been writing research articles and synopses of complex studies for many years, making things easier and simpler for students and other academic professionals to understand. Dr. Mandal is passionate about bringing health science to people from non-science backgrounds and has been writing health and drug-related articles for the general public for over a decade. She is a consultant for most of her colleagues and friends, not only when it comes to health and wellness issues but also about medications, and possible drug-drug and drug-food interactions. Dr. Mandal is a passionate advocate of good newborn care, breastfeeding, child rearing practices and hopes to reach out to new mothers in remote locations with little access to good healthcare, dispelling myths and superstitions. Dr. Mandal also works as a medical writer for the pharmaceutical industry, preparing scientific and authentic drug promotional literature. She prepares study material for practitioners for CMEs, focussing on rational drug prescribing and therapeutics. In this capacity, she has worked with some of the world’s leading pharmaceutical establishments, writing on newly launched drugs, vaccines and drug combinations. Dr. Mandal is the co-ordinator for the Adverse Drug Reaction Monitoring Centre (AMC) for her college. She and her team routinely visit the different wards and out-patient departments, gathering information on side effects and therapeutic misadventures and reporting them to the central department of Pharmacovigilance under the National Pharmacovigilance Programme (PvPI). From the centre in New Delhi, these reports are directly sent to Uppsala, Sweden, to their databases. She feels passionately about constant vigilance regarding new and serious adverse events related to medication use. She has experience with drug prescribing challenges in children and in the elderly population and has several research activities and publications related to rational drug prescribing even in the remotest of health centres of her region. Another area of Ananya’s work includes the advancement of Medical education technology among existing medical teachers. She is the Joint co-ordinator of the Medical Education Unit (MEU) of her college and routinely hosts workshops and speaks at training sessions, panel discussions and symposiums for her colleagues and fellow teachers. At these events, delegates discuss the implementation of new and more advanced methods of effective medical education. She has published numerousresearch papers and has several ongoing research activities related to medical education and its challenges in today’s society. One of her key areas of interest is the development of effective ethical and communication skills among medical students. She believes in effective ethical practice and communication with the patients to be the foundation for good clinical practice. Here, she focuses on methods of communication of various health and drug related issues to the general public by fresh medical graduates to minimize doctor-patient conflicts and to improve therapeutic outcomes and satisfaction. Dr. Mandal's continued attachment to the online platforms where she writes, is an attempt to make correct medical information accessible to the general public. She believes in patient education and awareness and preventive medicine along with rational therapeutics and hopes to fulfill her role as an educator and teacher as well as a Clinical Pharmacologist.